Home » Uncategorized » The volcano that gave us the bicycle! The volcano that gave us the bicycle! 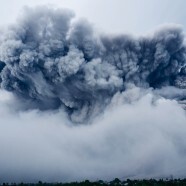 The 1815 eruption at Mount Tambora is widely considered the most damaging in human history. It led to global extreme weather change. The harvests failed and 1816 is remembered in Europe as the year without a summer. Europe had seen failing harvests since 1812. The extreme summer of 1816 forced people to eat their remaining cattle and horses, famine occurred. The German inventor Karl Drais started to develop a machine that could replace the horse for transportation. In 1817 he introduced “Die Laufmaschine” (Veliocipede).